During the first 15 days of our 45-day campaign to update 1,000 PRP patient profiles, we reached out to 1,607 patients or caregivers. The good news — we are one-third of the way to reaching our goal. The first observation worthy of note is that 75% of those who have responded thus far are members of the PRP Facebook Support Group. The majority of the 25% who are not “PRP Facebookers” are alumni of the original PRP [list-serve] Support Group that was formed in 1997. We will be making an extra effort to update their PRP profiles. What is a PRP Patient Profile? 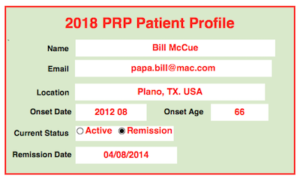 A PRP patient profile consists of only seven datapoints, e.g., patient name, email address, location, onset date, onset age, current status (active vs. remission) and, if applicable, the remission date. While we hope to share the data with any legitimate PRP researcher, we will NOT share the name of the patient or the email address of the patient/caregiver. 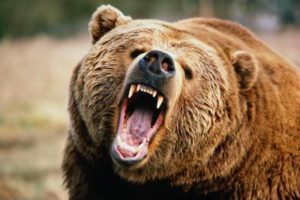 Why did we “Poke the Bear” 660 times? One of the initial challenges we faced was the fact that a total of 660 members of the PRP Facebook Support Group have no email address on file. The solution: explain the PRP Patient Profile Update campaign using Facebook’s private messaging feature. Six volunteers were recruited to send private messages to all 660 fellow PRP Facebookers. Divided into 33 batches (20 members per batch), Murray R, Jandina G, Curtis S, Correen P, Keeley T and Brad D set about sending private messages. It was a real team effort. In the process, three over-achievers sent too many private within a short period of time and tripped an alarm. We soon discovered that the Facebook Bear had been poked. Even though some of us were put in Facebook’s equivalent of “Time Out” for 24-48 hours, we survived. More importantly, we all found satisfaction in developing strategies to “pass the word” about updating patient profiles without “Poking the Bear”. How will we use your Onset Date and Onset Age? In March 2003, in his oft-quoted Dowling Oration, Dr. Andrew Griffiths set several standards regarding the prevalence of PRP. Regarding the classification of PRP, for example, he affirmed that 55% of the PRP patient population will experience the onset of PRP as adults while 45% will begin their PRP journey as juveniles. His estimates were based on 35 years of personal experience and a “show of hands” at meetings of the British Association of Dermatologists. There are some who find fault with his methodology. Once PRP is diagnosed, the determination of Adult Onset versus Juvenile Onset can be ascertained by the age at onset. The PRP Community Database currently reports the onset age for 745 PRP patients worldwide. Of these, 79% were adult onset (21 years of age and older) and only 20.5% are juvenile onset. Not quite what Dr. Griffiths postulated. Now fast forward to June 1, 2018 and imagine that we have onset data for 1,000 PRP patients worldwide. As an informed patient population, the PRP community will be able to shed light on the prevalence of Adult Onset versus Juvenile Onset. 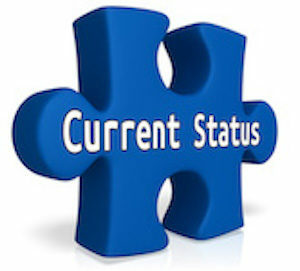 How will we use your “Current Status”? 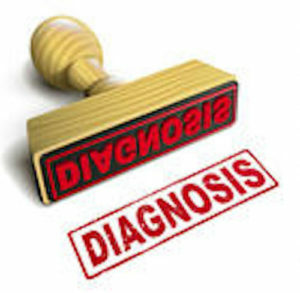 One of the most frequently asked questions we hear from newly diagnosed PRP patients/caregivers is this: “How long will PRP last?” The answers they hear (or read) are once again based on Dr. Griffith’s clinical observations and “show of hands” methodology. Those who have already updated their PRP patient profiles have classified their current status as either “Active” (67%) or “Remission” (33%). Those in remission have included the Date of Remission. On June 1, 2018 we will know how the duration of PRP for a much larger sampling of 1,000 PRP patients. Perhaps Dr. Griffiths’ estimates are spot on. We will see.